Ugo Piazza (Moschin) has just gotten out of jail. All he wants to do is reconnect with old flame Nelly (Bouchet) but some gangsters are making his life a lot more miserable than it already is. They are convinced Ugo has $300,000 stashed away somewhere, and they intend on harassing him until he forks it over. Rocco (Adorf) keeps pushing Ugo, and at the top of the ladder is a sinister crime lord known only as “The Americano” (Stander). Ugo goes to visit his old friend Chino (Leroy) for help - and now Chino is involved in the whole mess. Not just with gangsters, but with the local cops as well. Luckily, the Police Commissioner (Wolff) and an idealistic cop named Mercuri (Pistilli) are constantly engaged in a back-and-forth dialogue about left wing and right wing issues. But does Ugo actually have the money? And if so, will he make it out of this treacherous situation? 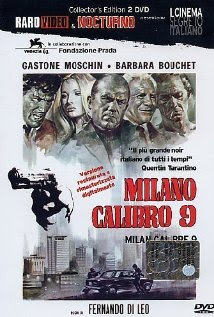 Milano Calibro 9 (or just Caliber 9 to us Americans) is another excellent Fernando Di Leo movie. It’s beautifully shot and edited, and the plot is always engaging and intriguing. From the killer opening on down, this movie more than delivers the goods in the entertainment department. And although the plot may seem simple, there’s a lot of food for thought as well. That seems to be a tricky thing to pull off, but Di Leo does it and we all benefit. Set in Milan (hence the Italian title), we are immediately thrown into a dangerous world. But it’s a beautiful world on the surface, and nowhere better is this symbolized than by Barbara Bouchet’s character, Nelly. Her beauty is overwhelming, and even her apartment is dazzling. But just below the surface is violence and instability. Gastone Moschin plays Ugo perfectly, in a very stoic manner. He has a great face, and if this movie was remade today (which hopefully it won’t be), Jason Statham could play the Ugo role. Stylistically, this movie is ahead of its time and is strikingly modern. Sure, it may be a world of rotary phones, typewriters and cops who drink and smoke pipes at the station (which is fascinating to modern eyes because it represents a time long past, never to return), but on a technical level, this movie could have come out this year. Di Leo masterfully brings technical expertise together with quality writing and performances and naturally a winner of a movie emerges. Not a lot of directors can achieve what he achieves and that’s a testament to his talent. And the music! The music is beyond awesome. As if getting the genius Bacalov wasn’t enough, he also brought on board the great band Osanna (for those who don’t know, they’re a big name in the Italian prog community). Di Leo was a fan of the album Bacalov did with The New Trolls, and fans will note that parts of the great album “Concerto Grosso” are used in the background as well. We can’t speak highly enough of the music in this movie. It truly puts the icing on an already-excellent cake. Definitely see Milano Calibro 9. Happy you like it too! Solid movie. Looks incredibly slick and fun. Thanks for the review.
" Jason Statham could play the Ugo role" Ugh. 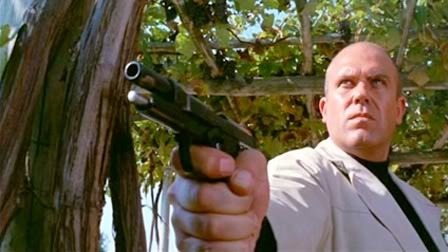 That atrocious blasphemy almost made me instantly close this blog... Statham has not even one ounce of Moschin dramatic actor talent... you have got that one wrong, trust me. My favorite italian "polizieschi" (cops) movie. I guess we have to agree to disagree on that point. Still a solid movie.